From left to right: Vic Knox (NPS), Rhett Jeppson (Mint), Teddy Roosevelt mascot, Gerry Gabrys (GSI), Will Shafroth (NPF). The 100th Anniversary of the National Park Service Act (public law 113-291) was signed into law December 19, 2014, directing the United States Mint to strike and issue commemorative coins honoring the National Park Service’s century of stewardship of America’s treasured national parks. Surcharges from the sale of 100,000 $5 gold coins, 500,000 $1 silver coins and 750,000 half dollar clad commemorative coins are authorized to support the National Parks Foundation, which will use the funds for projects that help preserve and protect resources under the stewardship of the National Park Service and promote public enjoyment and appreciation of these resources. 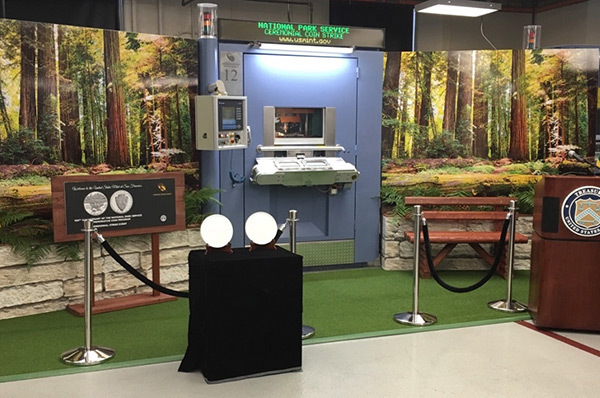 The United States Mint at San Francisco welcomed guests from the National Park Service on March 9, 2016, to participate in the ceremonial striking of the coin commemorating their centennial. U.S Mint staff created a dramatic backdrop for the area surrounding the coining press. Imagined and constructed by the joint efforts of the Plant Engineering and Coining Division Teams, the backdrop simulated the tranquility found at Muir Woods National Monument, a unit of the National Park Service located in Marin County, CA. Plant Manager David Jacobs welcomed guests before Chief of Staff Elisa Basnight delivered remarks about the beauty of our National Parks and the significance of the program’s coin designs. 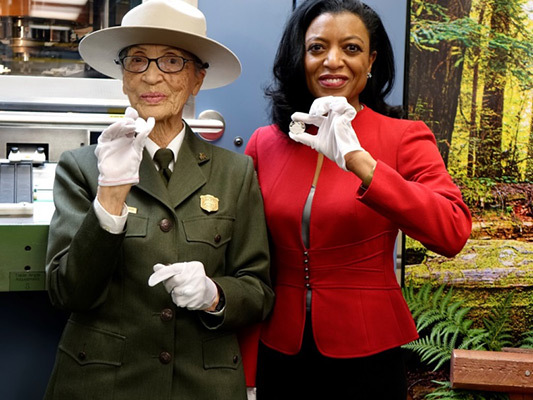 National Park Service Ranger Betty Reid Soskin also delivered remarks before pushing the button to ceremonially strike a clad proof coin. Deputy Plant Manager Paul Lewis offered closing remarks. 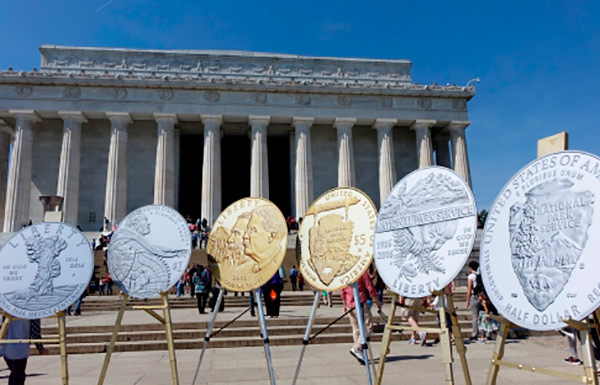 The U.S. Mint joined the National Park Service and the National Park Foundation again on March 24, 2016, this time in Washington, D.C., to kick-off the start sales for the 100th Anniversary of the National Park Service Commemorative Coins. The event took place on the steps of the Lincoln Memorial on the National Mall. It was a picture perfect day, and as expected there were hundreds of people on the mall for the peak day of the cherry blossoms. Many stopped by to admire the designs of the coins and take pictures, which were prominently displayed on 30-inch round blow ups. Social media posters also invited participants to join the conversation and interact using the hashtags #NPScoin, #FindyourPark and #usmint. The Washington Nationals’ Racing President Teddy Roosevelt was on hand to pay tribute to President Roosevelt’s role in creating the National Park Service. 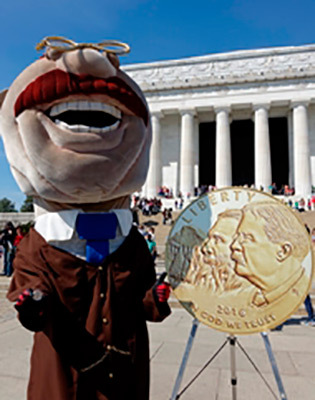 Racing Teddy interacted with the crowd before the event and posed for pictures with his “likeness” on the gold coin. After the event he went racing into the crowd and treated them to his workout routine in between the Lincoln Memorial and the reflecting pool. National Park Service Associate Director for Park Planning, Facilities, and Lands Vic Knox welcomed the crowd, acknowledging the honor of being represented on currency and the great designs that depict people, places, and stories that represent the National Park Service experience. National Park Foundation President and CEO Will Shafroth spoke of the recipient organization’s plans to use the funds to help them continue their efforts to protect America’s treasured places, connect people from all backgrounds to them, and inspire the next generation of park stewards. United States Mint Principal Deputy Director Rhett Jeppson delivered remarks about the commemorative coin program and talked about his favorite president Teddy Roosevelt, along with his personal connection to the parks. Jeppson concluded with how proud he was of the collaboration throughout the entire process from inception to the final designs and coin production. Designed and sculpted by Don Everhart, the gold coin obverse (heads side) features John Muir and Theodore Roosevelt with Yosemite National Park’s Half Dome in the background. The gold coin reverse (tails side) features the National Park Service logo. The silver coin obverse, designed and sculpted by Joe Menna, features Yellowstone National Park’s Old Faithful geyser and a bison. The silver coin reverse, designed by Chris Costello and sculpted by Jim Licaretz, depicts a Latina Folklórico dancer and the National Park Service logo, representing the multi-faceted cultural experience found in America’s national parks. The clad half dollar obverse, designed by Barbara Fox and sculpted by Michael Gaudioso, features a hiker discovering the majesty of the wilderness and a small child discovering a frog hiding in ferns, celebrating the diversity and breadth of the National Park Service. The clad half dollar reverse, designed by Thomas Hipschen and sculpted by Charles Vickers, features the National Park Service logo. Find images of the 2016 National Park Service 100th Anniversary Commemorative Coins here. For products and pricing, click here.